The previous G63 on full acceleration felt like being in a house falling off a cliff and it did 0-60 in 5.3 seconds. 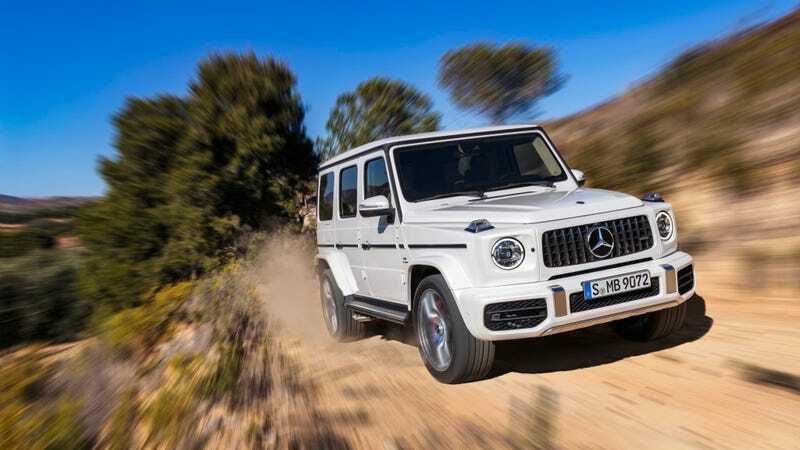 The new 2019 Mercedes-AMG G63, with 577 horsepower from AMG’s ubiquitous 4.0-liter twin-turbo V8, does the run in 4.4. That’s got to feel like being in an old casino in the midsts of a demolition. That’s got to feel like being shot out of a cannon, facing down, off of a skyscraper. That’s got to feel, well, it probably feels really strange. The new G-Class is more civilized than the previous one on-road, thanks to independent front suspension. What’s odd is that the 2019 G63 only makes 14 more horsepower than the 2018, though the 2019 makes 627 lb-ft of torque (60 more than the last model) and drops about 146 pounds as well (5478 lbs vs 5624 for curb weight). The 9-speed automatic likely helps in that acceleration figure. The new 22-inch wheels likely do not. Mileage is a claimed 13.2 liters per 100km, a slight improvement over the old one’s 13.8. Converting that to miles per gallon gets you around 18 vs 17 mpg combined, roughly. You can check the full specs here on Daimler’s press site, just don’t expect to find new prices. But none of that is really important, not even the funky new grille or the weirder looking fender flares. The new G63 keeps the side pipes and that’s all that matters.